It is estimated that approximately 90% of dogs and cats over 2 years of age are affected by dental disease. All dogs and cats are at risk of developing dental problems, although dental disease is more commonly seen in smaller dog breeds. Being aware of the warning signs may help your pet avoid oral health problems in the future. Plaque is the cause of most dental problems in pets. Plaque is a sticky yellow material containing bacteria, cells and tiny food particles. Left untreated the plaque hardens into a substance called tartar that forms along the base of the tooth near the gum line. This causes inflammation (reddening) of the gums and is called gingivitis. Eventually this results in loosening of the tooth and eventually tooth loss. Caring for your own teeth has become second nature and regular visits to the dentist are commonplace. Your pets need dental care too, and the sooner you start, the easier it will be for you and your pets. Don’t wait for plaque to build up before you start a dental hygiene routine. Get your pet used to having its mouth examined and teeth touched and eventually brushed. Start as soon as you acquire your pet. Make it a pleasant experience for your pet. Praise your pet for letting you look into the mouth. This could be verbal or with a small treat there are dental treats on the market that you could use in this instance too). Even if your dog only holds still for a short time, give lots of praise. There are veterinary recommended toothpastes on the market which should be introduced slowly. They are very palatable and contain abrasives which clean the teeth and gums. Initially get your pet used to the toothpaste by applying it with your finger and build up to using a soft veterinary recommended toothbrush (over a period of 2 – 3 weeks). Do not use a human toothbrush as the head is too big and the bristles too hard. Human toothpaste is also not suitable for pets. 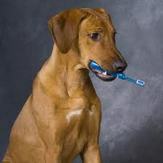 Ideally try and brush your pets’ teeth daily or at least 2-3 times per week. Should you find the teeth brushing exercise too tedious there are dental treats available for dog to chew on although these are not as effective as brushing. Premium pet food and Prescription Diets are available from your veterinarian and have different levels of oral care. Some offer a specially designed kibble that brushes the teeth as the pet eats (mechanical action), others offer and ingredient in the food that combines with the saliva while eating to help remove the plaque (chemical action). Soft food (canned) as the only diet is not recommended as it impacts on the teeth providing a medium for bacteria to grow and flourish. As part of your pets’ annual check up, and annual booster vaccination, your pets’ mouth and teeth will be examined. If any dental disease is found, a dental scale and polish will be recommended. This procedure is accomplished under general anesthesia. Ultrasonic teeth scalers are used for this procedure followed by a polishing and fluoride treatment. Post operative antibiotics are provided to decrease oral bacterial numbers and prevent infection.